In today’s era, organisations especially large enterprises are often challenged with shrinking revenues from existing products and services. Furthermore technological breakthroughs and incremental product development no longer necessarily provide the competitive differentiators to grow their business. Management need to investigate how to reinvent ways to sustain innovation and to stay in front of their competitors. The process of innovation is often seen as being very linear, with business models created from market research results, leading to large development efforts creating products that fail to meet customer’s need. The goal of a new product development is to figure out the right thing to build—the thing customers want and will pay for—as quickly as possible. But why do new products fail so badly everywhere we look? The first problem is the allure of a good plan, a solid strategy, and thorough market research. In earlier eras, these things were indicators of likely success. So what has changed? In today’s era this approach does not work as organisations operate under extreme uncertainty. We must learn what customers really want, not what they say they want or what we think they should want. We need to go beyond asking hypothetical questions, and observe real customer behaviour. Each part is fit for purpose in the cycle of innovation. Design plays a significant part of innovative business models and it is important in creating value for users. Through working with a product development team in a large enterprise I have observed how well Design Thinking complements Lean Startup. Lean Startup is taking the world by storm, however, the build-measure-learn cycle does not address the design and ideation cycle – how do organisations and teams identify ideas, customer insights and leap-of-faith assumptions that need to be validated? Thinking like a designer certainly will help transform the way you develop products, services, processes and even strategy [Tim Brown, CEO of IDEO] through contextual inquiry and observing customer behaviours. Immersing yourself in the context and observing customer behaviours helps you unearth details and intricacies of the problem space. Accurate observations will help you generate insights, create ideas and develop initial product designs for a customer segment. These ideas, designs and leap-of-faith assumptions can then be further validated using Lean Startup. Lean Startup supports the launching of businesses and products. It relies on validated learning, scientific experimentation, and iterative product releases to shorten product development cycles, measure progress, and gain valuable customer feedback. In this way, organisations can design their products or services to meet the demands of their customer base without requiring large amounts of initial funding or expensive product launches. Lean Startup is a learning framework for “disruptive innovation” defined as unknown problem, customer & market, solution & the search for “the right thing to build”. The primary output being a validated business model through, rapid iteration, empiricism & non-vanity metrics to measure progress. The design thinking process provides a vehicle to generate tested ideas quickly. The Lean Startup approach can then be used to validate the ideas, customer insights and leap-of-faith assumptions using experiments. 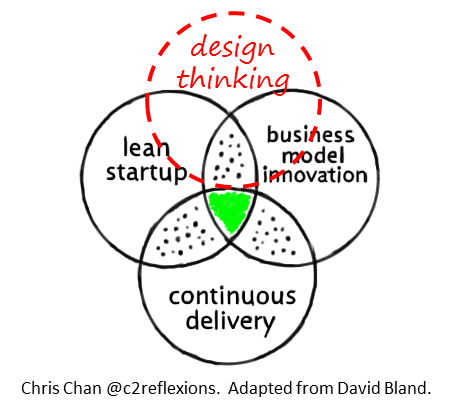 Both Design Thinking and Lean Startup take a very similar iterative and customer driven development design approach. The combined approach of Design Thinking and Lean Startup provides a systematic approach for organisations to create disruptive innovation. The Business Model Canvas is one of the most used business model frameworks. The Business Model Canvas allows you to rapidly create and capture the rationale of how an organisation creates, delivers, and captures value. Design Thinking informs the Business Model of opportunities (eg who our customers are and what they value). The Business Model can be systematically validated/invalidated through Lean Startup experiments. Lean Startup is the framework to rapidly iterate over the business model. Ultimately, this allows us to test the business viability, and to change and adapt our business model to take advantage of the opportunities. Any part of the business model that is validated can be quickly delivered to customers through small releases (minimal viable products) using iterative and incremental approach of agile development. Lean and Agile values, principles and practices provides the means for organisations to amplify the leap-of-faith assumptions by continuously delivering value to users through iterative and incremental development. In the race to create new innovative product and services, organisations will need to move away from the linear approach to innovation using assumptions based on market research. 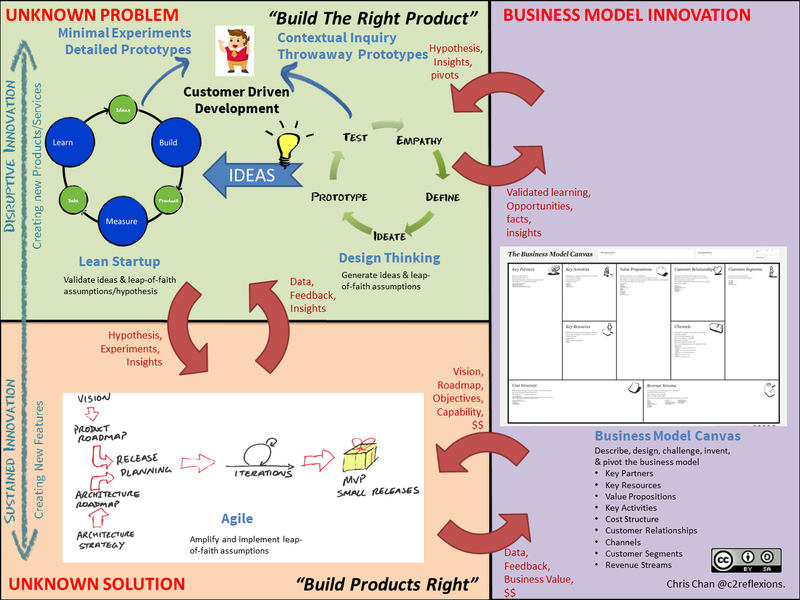 The combination design thinking, lean startup, business model canvas and agile is a holistic approach that has a push towards customer centricity that really helps provide a framework to create and sustain an innovation pipeline. Ultimately these 4 parts provides a model to build an innovative culture and delight customers with the right product that has the right solution and market fit. To create a sustaining innovation pipeline organisations may circle back through design thinking, Lean Startup, and Agile for implementation more than once as the product team refines its ideas and explores new directions. You may also like to read a very nice article by David Bland describing the need to combine Lean Startup + Business Model Innovation + Continuous Delivery and why each by itself is not enough. I have adapted David’s venn diagram to explicitly include where I think Design Thinking fits. A previous post I wrote, Enlightened trial and error succeeds over the planning of the lone genius illustrates Design Thinking in action by IDEO. Hi Philip, Thanks. I am glad you liked the idea!